o create the perfect engagement ring that will be both a surprise and an object of love is a challenge Alex embraces regularly. Being the epitome of love and representing the beginning of a couples life together the engagement ring must be many things in one. Alex approached this project with care and attention, taking time to consult carefully with the fiancée, and the future bride’s friends and family to make an ideal token of love. Veronica was described as a very active and interesting person who liked adventure and colour. 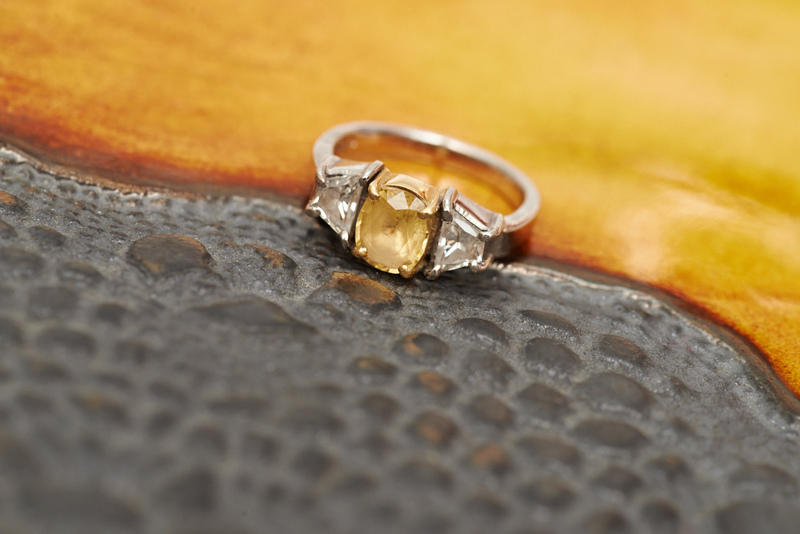 That is why Alex chose an unusual cushion cut yellow sapphire as the centre stone to match Veronica’s personality. To add more sparkle and emphasise engagement, two tapered brilliant cut diamonds were used on both sides of main gem. White and yellow 18 carat gold was chosen to hold the precious stones and create the perfect combination that would mirror the couples love.